There is growing interest in hobby-scale farming techniques. In response to this need, UF/IFAS Walton County Extension Office established a hobby farm featuring a variety of low-input food production options. The farm is a cooperative venture drawing on expertise of the Horticulture, Aquaculture/Marine Science, 4-H, and Agriculture programs. The farm is on a relatively small, tenth acre, plot behind the County Extension Office where staff and volunteers have installed aquaponics and hydroponics systems, honeybee boxes, a chicken coop as part of the 4-H Chick Chain Program, herb garden, raised vegetable bed system, sustainable citrus grove, muscadine grape trellis, shiitake mushroom structure, and blueberry orchard. 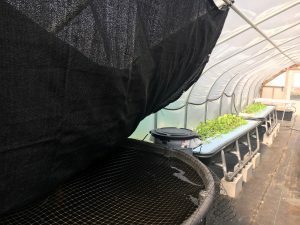 The aquaponics demonstration system was constructed in 2017 using materials purchased at local stores, Tractor Supply Company and Lowes, or on Amazon.com. The system has a 300 gallon Rubbermaid fish tank that gravity feeds into a 20 gallon plastic garbage can with lid stuffed with bird netting for solids removal and biofiltration. The water then feeds into two 2 ft. x 8 ft. feed troughs with approximately 2 square yards of floating Styrofoam grow beds. Finally the water drains into a 100-gallon sump where it is pumped back into the fish tank. A small air pump provides supplemental air to the fish tank and a small water heater helped maintain temperatures during the winter. The fish tank is stocked with 18 catfish, originally 4-5 inches, now approximately 10-12 inches, and pushing a half-pound each. 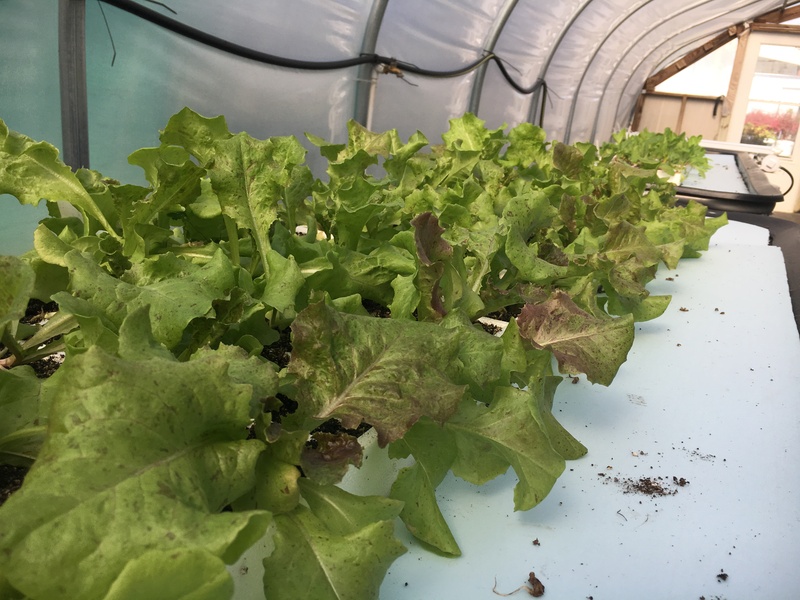 The system produced two crops of red and romaine lettuce during the last half of 2017 and is currently planted with romaine and red lettuce, Swiss chard and Napa cabbage. Lettuce is harvested out of the system every five to six weeks, while Swiss chard and Napa cabbage a take longer to reach harvest size. There is a lot of aquaponics information available on-line. Academic institutions and other research-based organizations are the best places to look for information. 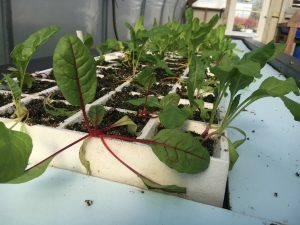 The University of Florida has a comprehensive factsheet entitled “A Practical Guide for Aquaponics as an Alternative Enterprise” available at http://edis.ifas.ufl.edu/hs1252. Also recommended is the Food and Agriculture Organization “Small-scale Aquaponic Food Production” manual available at http://www.fao.org/3/a-i4021e.pd. Aquaponic seminars or webinars are conducted upon request and provide introductory information on a variety of system designs and stocking options. Over 400 visitors have seen the aquaponics and other hobby-scale gardening demonstration plots over the past year, gaining knowledge and acquiring skills to use in their own gardens. 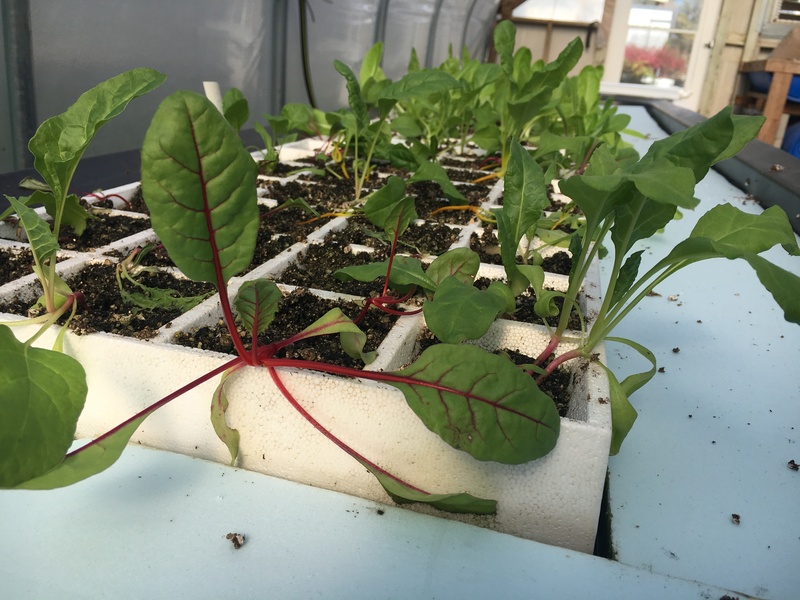 If you are interested in a signing up for the aquaponics email listserv, participating in a tour, having a personal consultation or attending a workshop, please contact Laura Tiu, lgtiu@ufl.edu. Hobby-scale aquaponics system at the UF/IFAS Walton County Extension Office. It is a great practice to start your own little garden, when less agricultural land is available for growing food. Genetically modified crops are available, we can grow our own food using Aquaponic/hydroponics. The first method did not require any food for plants as fish wastes will be used as a plant nutrient. Dr. Tiu is a Marine Science Extension Agent with the University of Florida Sea Grant.